If you want to see how it's done, go directly to the video below. Select Signature > Signatures from the Message menu. Depending on the size of your Outlook window and whether you're composing a new email message or a reply or forward, the Message menu and the Signature button might be in two different locations. In the E-mail account drop-down box, choose an email account to associate with the signature. You can have different signatures for each email account. If you want your signature added to all new messages by default, in the New messages drop-down box, select one of your signatures. If you don't want to automatically add a signature to new messages, choose (none). This doesn't add a signature to any messages you reply to or forward. If you want your signature to appear in the messages you reply to and forward, in the Replies/forwards drop-down, select one of your signatures. Otherwise, accept the default option of (none). Choose OK to save your new signature and return to your message. Outlook doesn't add your new signature to the message you opened in Step 1, even if you chose to apply the signature to all new messages. You'll have to add the signature manually to this one message. All future messages will have the signature added automatically. To add the signature manually, select Signature from the Message menu and then pick the signature you just created. Select the Image icon , locate your image file, and select Insert. When you're done, select OK, then select OK again to save the changes to your signature. If you don't choose to insert a signature for all new messages or replies and forwards, you can still insert a signature manually. Choose your signature from the fly-out menu that appears. If you have more than one signature, you can select any of the signatures you've created. Open a new message. On the Message tab, in the Include group, click Signature, and then click Signatures. Type a name for the signature, and then click OK.
To format the text, select the text, and then use the style and formatting buttons to select the options that you want. Click Picture, browse to a picture, click to select it, and then click OK. Common image file formats for pictures include .bmp, .gif, .jpg, and .png. To finish creating the signature, click OK. Note: The signature that you just created or modified won't appear in the open message; it must be inserted into the message. Signatures can be added automatically to all outgoing messages, or you can choose which messages include a signature. Note: Each message can contain only one signature. In the New messages list, select the signature that you want to include. In a new message, on the Message tab, in the Include group, click Signature, and then click the signature that you want. Do you have feedback on creating or using Outlook signatures? We'd like to know. In particular, if you had trouble locating the Signatures menu, we'd like to know where you expected to find the option to create a signature. The Outlook programming team and the Outlook documentation team listen to your feedback. Click Yes or No at the bottom of your screen next to Was this information helpful? 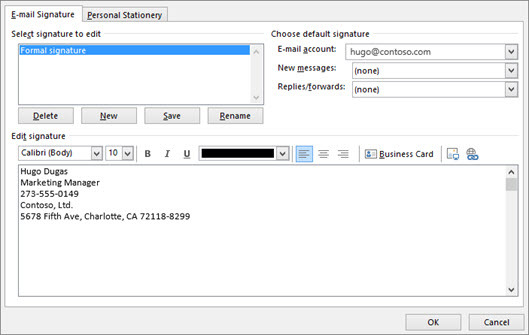 and leave your comments and suggestions for improving Outlook's signature feature. Please let us know what version of Outlook you're currently using as well as why you searched for help on creating a signature. We'll update this documentation regularly to answer as much of your feedback as we can.